Ears are black and the longest of any other North American bat in the genus Myotis; > 0.84 inches (>21 millimeters). When bent forward, ears extend > 5 millimeters beyond the tip of the nose. Wingspan of 10-12 inches (25-30 centimeters) and weighs 0.2-0.3 inches (5-8 grams). Coat color is dull brown to straw-colored with individual hairs black at the base (Adams 2003). 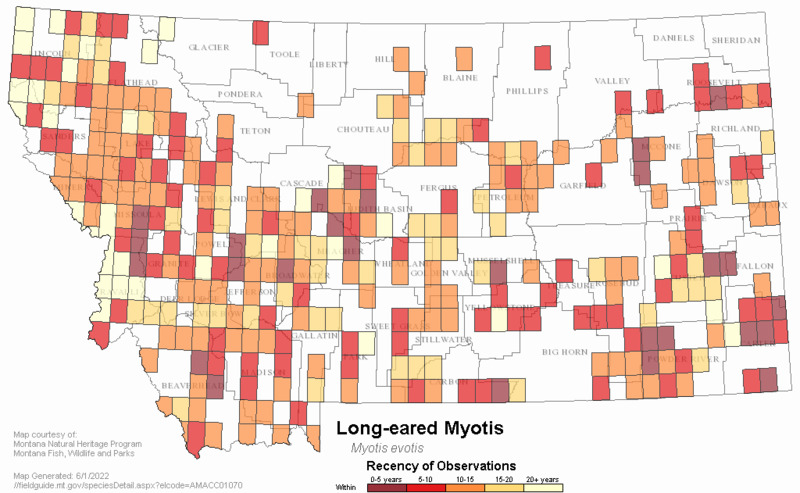 Possibly partially migratory; few winter records for Montana. Occupy a wide range of rocky and forested habitats over a broad elevation gradient (Jones et al. 1973). Summer day roosts include abandoned buildings, bridges, hollow trees, stumps, under loose bark, and rock fissures. Hibernacula include caves and abandoned mines. The species has been located hibernating in a mine in riverbreaks habitat in northeastern Montana (Swenson and Shanks 1979). Known to primarily eat moths and beetles, but also flies, lacewings, true bugs and spiders. Stomach content analysis of 3 specimens from the Ekalaka and Long Pines Hills area of southeast Montana revealed a cicadellid, a chironomid, a small moth (Lepidoptera), a scarab beetle; a dragon fly (Agrion spp. ); and a large, black bristly muscoid fly (Calliphoridae Diptera) (Jones et al. 1973). Typically emerge 10-40 minutes after dark. Highly maneuverable; glean prey from leaves and bark or off ground. Sexes segregated in summer with females in small maternity colonies. Females have one young per year, usually born in late June or July, and return to previously used maternity roosts. Albers, Mark., 1995, Draft Biological Assessment: Tongue River Basin Project. May 1995. In Tongue River Basin Project Draft Environmental Impact Statement. Appendix B. June 1995. Arnett, E.B. and J.P. Hayes. 2009. Use of Conifer Snags as Roosts by Female Bats in Western Oregon. Journal of Wildlife Management 73(2): 214-225. Chruszcz, B. and R.M.R. Barclay. 2002. Thermoregulatory ecology of a solitary bat, Myotis evotis, roosting in rock crevices. Functional Ecology 16(1): 18-26. Chruszcz, B. J., and R. M. R. Barclay. 2003. Prolonged foraging bouts of a solitary gleaning/hawking bat, Myotis evotis. Canadian Journal of Zoology 81:823-826. Faure, P.A. and R.M.R. Barclay. 1992. The Sensory Basis of Prey Detection by the Long-eared Bat, Myotis evotis, and the Consequences for Prey Selection. Animal Behaviour 44(1): 31-39. Findley, J.S. 1960. Identity of the long-eared myotis of the southwest and Mexico. J. Mammal. 41:16-20. Gannon, W.L. and G.R. Rácz. 2006. Character displacement and ecomorphological analysis of two long-eared Myotis (M. auriculus and M. evotis). Journal of Mammalogy 87(1): 171-179. Genoways, H.H., and J.K. Jones, Jr. 1969. 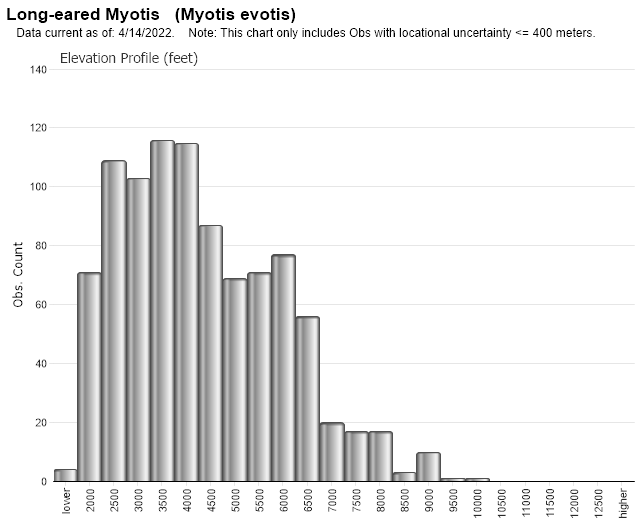 Taxonomic status of certain long-eared bats (genus Myotis) from the southwestern USA and Mexico. Southwest. Nat. 14:1-13. Hendricks, P., J. Carlson, and C. Currier. 2003. Fatal entanglement of Western Long-eared Myotis in burdock. Northwestern Naturalist 84:44-45. Jones, J. Knox Jr. and J.R. Choate. June 1978. 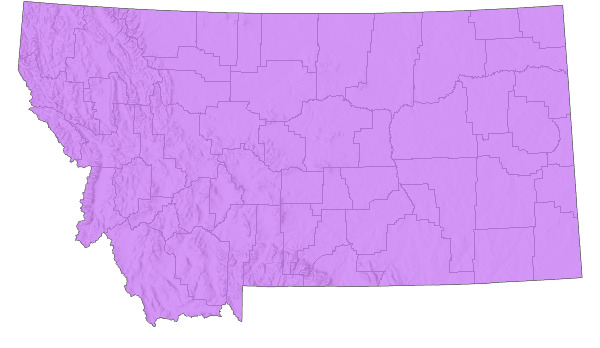 Distribution of two species of long-eared bats of the genus Myotis on the Northern Great Plains. Prairie Nat. 10(2):49-52. Lausen, C.L. R.R. Barclay. 2006. Winter bat activity in the Canadian prairies. Canadian Journal of Zoology 84(8): 1079-1086. Luszcz, T.M. and R.M.R. Barclay. 2016. Influence of forest composition and age on habitat use by bats in southwestern British Columbia. Canadian Journal of Zoology 94(2): 145-153. Madson, M., G. Hanson, S. Martinez, and D. Genter. 1993. Wintering bats in Montana: results of surveys in the Pryor Mountains with annotation on area caves and mines. Montana Natural Heritage Program. Helena, MT. 36 pp. Manning, R.W. and J.K. Jones, Jr. 1989. Myotis evotis. Mammalian Species 329:1-5. Marcot, B. G. 1984. Winter use of some northwestern California caves by western big-eared bats and long-eared Myotis. Murrelet 65(2):46. Nixon, A.E., J.C. Gruver, and R.M.R. Barclay. 2009. Spatial and temporal patterns of roost use by western long-eared bats (Myotis evotis). American Midland Naturalist 162(1): 139-147. Pettit, T. and K. Wilkins. 2012. Canopy and edge activity of bats in a quaking aspen (Populus tremuloides) forest. Canadian Journal of Zoology 90(7): 798-807. Rancourt, S. J., M. I. Rule, and M. A. O'Connell. 2005. Maternity roost site selection of long-eared myotis, Myotis evotis. Journal of Mammalogy 86:77-84. Schmidt, C.A. 2003. Conservation assessment for the long-eared myotis in the Black Hills National Forest, South Dakota and Wyoming. Custer, South Dakota. 23 p.
Schwab, N.A., T.J. Mabee and R.J. Ritchie. 2012. An acoustic study of winter bat activity at three hibernacula, Montana, 2011. ABR Inc - Environmental Research and Services. Forest Grove, OR. 34pp. Snider, E.A., P.M. Cryan, and K.R. Wilson. 2013. Roost selection by western long-eared myotis (Myotis evotis) in burned and unburned piñon--juniper woodlands of southwestern Colorado. Journal of Mammalogy, 94(3), 640-649. Solick, D. I., and R. M. R. Barclay. 2006. Morphological differences among Western Longeared Myotis (Myotis evotis) populations in different environments. Journal of Mammalogy 87:1020-1026. Solick, D.I. and R.M.R. Barclay. 2007. Geographic variation in the use of torpor and roosting behaviour of female western long-eared bats. Journal of Zoology 272(4): 358-366. Solick, D.I. and R.R. Barclay. 2006. Thermoregulation and Roosting Behaviour of Reproductive and Nonreproductive Female Western Long-eared Bats (Myotis evotis) in the Rocky Mountains of Alberta. Canadian Journal of Zoology 84(4): 589-599.
van Zyll de Jong, C.G. 1979. 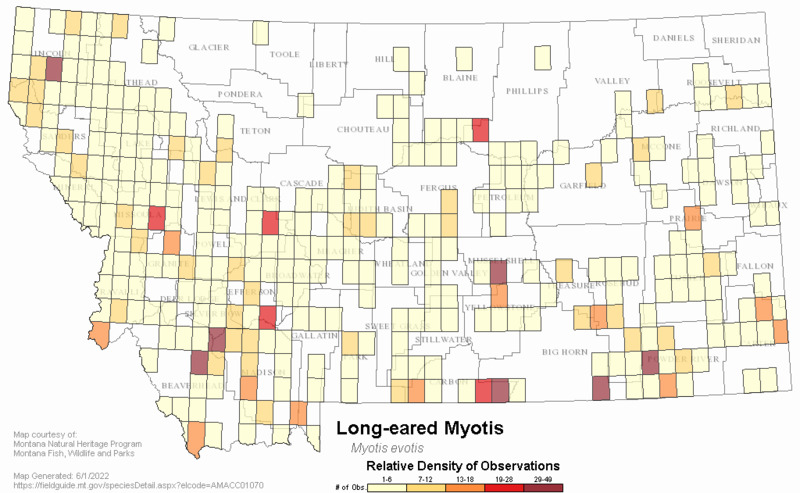 Distribution and systematic relationships of long-eared Myotis in western Canada. Can. J. Zool. 57:987-994. Vonhof, M. J., and R. M. R. Barclay. 1997. Use of tree stumps as roosts by the Western Longeared Bat. Journal of Wildlife Management 61 :674-684. Waldien, D.L. and J.P. Hayes. 2000. Day-roosts of female long-eared myotis in western Oregon. Journal of Wildlife Management 64(3): 785-796. Waldien, D.L. and J.P. Hayes. 2001. Activity areas of female long-eared myotis in coniferous forests in western Oregon. Northwest Science 75(3): 307-314. Waldien, D.L. and J.P. Hayes. A technique to capture bats using hand-help mist nets. Wildlife Society Bulletin 27(1):197-200. Web Search Engines for Articles on "Long-eared Myotis"